NOTE: The following treatise is rather long (15K). You may wish to use your browser to save it and review or print it out later. It is mostly about the Mexican War as it affected the Arizona region. The writing of nineteenth-century American history is often dominated by the great and furious events of the Civil War of 1861-1865. This is only rightly so, as that war shaped subsequent American life in ways that reverberate down to even our own time. There was, however, another war in that century, nearly forgotten today, that also had an enormous impact on America: the Mexican War of 1846-1848. In many ways, the Mexican War was, indeed, the forerunner of the Civil War, for most of the great warriors of 1861-1865 actually had their first taste of battle, and tested their character, in the Mexican War. But, even more importantly, as a direct result of the Mexican War the United States acquired dominion over lands that nearly doubled its previous size. The future states of Texas, New Mexico, Colorado, Utah, Nevada, Arizona, and California were all obtained as a direct result of the war. Much of the future economic wealth of the United States--indeed, its very status as a truly world power--must be attributed to this huge land acquisition. It fundamentally changed the course of American history and should therefore be more widely recognized. The causes of the Mexican War were directly related to the Texas declaration of independence from Mexico in 1836. Many Americans had begun settling in the Spanish-Mexican province of "Coahuila-Texas" beginning in the first years of the century. Moses and Stephen Austin were a few of the primary American colonizers. When Mexico achieved independence from Spain in 1821, the province was basically neglected by the Mexican government. The Texas revolution was in direct response to that neglect. Not only were the American residents of the region in favor of independence, but so were many of the Mexican residents, although not the Mexican officials. When independence was achieved because of the battles at the Alamo and at San Jacinto (Sam Houston commanded the victorious troops against Santa Anna at San Jacinto), Texans--American and Mexican alike--were proud of their newly-independent nation: the "Lone Star"of Texas. They remained an independent nation for ten years, and were recognized by Great Britain, the United States, and France, but not by Mexico. However, by 1845 there was much confusion about the status of Texas. Talk of war was in the air between the United States and Great Britain because of the Oregon Territory (later to become the states of Washington, Oregon, Idaho, and part of Montana). Mexico was politically weak, and the United States feared that Great Britain intended to annex California, Texas, and even the Yucatán (Yucatán was for many years semi-independent of Mexico.) As there were many Americans in Texas, they expressed their desire to become a part of the United States and to block British designs. Of course, in all the confusion, Mexico also wished to re-assert its claim. Accordingly, the United States annexed Texas, and President James K. Polk sent General Zachary Taylor to protect the southern part of the new state. By the spring of 1846 Mexico decided to cross the disputed boundary, and war was declared by the United States. Great Britain, however, ceased talk of war and ceded the Oregon Territory to the U.S. in June 1846. After war was declared against Mexico, there was some confusion in Washington about how to prosecute it. General Taylor began having significant successes against the northern Mexican troops just across the Texas border, but there was a question that he could proceed all the way to Mexico City, a thousand miles away. It was therefore decided that several strategies should be attempted. General Zachary Taylor was to continue building the strength of his army (mainly from Texas volunteers) and to continue marching from the north as circumstances permitted. Commodore John D. Sloat, Navy Commander in the Pacific, was to blockade western Mexico ports and California. (He was later replaced by Commodore Robert F. Stockton.) Commodore David Conner began blockading the Gulf Coast ports of Mexico. General Stephen W. Kearny, commander at Fort Leavenworth on the Missouri frontier, was to gather western troops (an "Army of the West") and march on Santa Fe. Secret orders were also given to him to march all the way to California, where he was to assume command. A short time later, General John E. Wool was to lead an expedition from San Antonio, Texas, to Chihuahua and then Mexico City. (One of his officers was Robert E. Lee, later the great Confederate general of the Civil War). Finally, General Winfield Scott, commanding U.S. Army General, was to eventually capture the eastern Mexican port of Veracruz and march directly to Mexico City, where he was expected to terminate the war together with Generals Wool and Taylor. Throughout the years of 1846 and 1847 the war continued. Zachary Taylor saw much success, as did most of the other U.S. forces. General Kearny, however, encountered peculiar problems in his assignment. He had to cross nearly an entire continent in order to complete his mission. It was a daunting task--through prairies, mountains, and deserts which few Americans had ever seen before. At Fort Leavenworth, Kearny gathered most of his volunteers from Missouri. One of his main officers was Colonel Alexander Doniphan. Another was Captain E.V. Sumner, later to command a corps of the Army of the Potomac during the Civil War. Kearny's men marched through the spring and summer over the prairies and arrived in Santa Fe in August 1846. On 22 August 1846 Kearny issued a proclamation "claiming the whole of New Mexico . . . as a territory of the United States of America." There was almost no resisitance, because the people of New Mexico were similar to the Texans in feeling neglected by the Mexican government. On that same day (August 22) Commodore Stockton also set up a new government in California, under the United States flag. Kearny's secret orders, however, maintained that he should not only claim New Mexico, but that he should march on to California to take command. He was in a rather difficult position. For one thing, he had only a few men. For another, Doniphan's command had to be detailed to protect New Mexican citizens against the Navajo, the Cheyenne, the Arapaho, and other Indians. Some of Kearny's men also had to remain in New Mexico to maintain civil peace. Kearny's dilemma, however, had already been anticipated in Washington. There was another source of soldiers which could be tapped--the Mormons, who in 1846 were about ready to move into the "American wilderness." On 19 June 1846 Colonel Kearny gave an order to Captain James Allen at Fort Leavenworth to request recruits from the Mormons stationed at Council Bluffs, Iowa. On 26 June 1846 Captain Allen arrived at Mount Pisgah (one of the Mormon camps) and published a circular requesting recruits to serve one year. They were to meet the "Army of the West" at Santa Fe and then march to California, where they would be discharged. On 1 July 1846 Captain Allen met with Brigham Young and several others of the "Quorum of the Twelve." Brigham Young and the council decided almost instantly that a battalion should be called. Young stated, "If we want the privilege of going where we can worship God according to the dictates of our consciences, we must raise the Battalion." Five companies of men (about 500) enlisted. The Mormon Battalion left Council Bluffs on 20 July 1846 and arrived August 1 at Fort Leavenworth, where the men drew arms. As the Battalion proceeded towards Santa Fe, a few men fell sick and died, and on August 23 Colonel James Allen himself died. He had come to respect and trust the Mormon men. In fact, he considered the Battalion an altogether remarkable group of men. Captain Jefferson Hunt, Mormon leader, served as Battalion commander until the regularly-appointed officer, Lieutenant (later Colonel) Andrew J. Smith, arrived. He was not a friend of the Mormons, and upon arrival of the main body of the Battalion at Santa Fe in the middle of October 1846, he relinquished his command. In the meantime, while the Battalion was marching towards Santa Fe, General Kearny decided that he could not wait any longer for them. He left orders that when the Battalion arrived at Santa Fe, Lieutenant Colonel Philip St. George Cooke should become the commander. Cooke was ordered to then have the Battalion follow him to California. When Kearny discovered from Carson that California was already a U.S. possession, he decided to send 200 of his men back to Santa Fe to continue serving there until the Mormon Battalion arrived. Kearny thought that he could travel faster, and thus take command in California quicker, if he kept only 100 men with him (including map and terrain specialists). He left all wagons behind and proceeded with only a mule train. Kearny's journey into Arizona down the Gila was fairly uneventful until he reached the Pinal Mountain area in November 1846. Trying to avoid the difficult narrows at where Coolidge Dam is now located, he crossed through El Capitán Pass in the Pinals and descended into what is now called Dripping Springs. He had made contact with Pinal Apache Indians in the area, who promised they would obtain some fresh mules for his expedition. At this time the Apaches were friendly to Americans, for they believed that the Americans could help them in their wars against the hated Mexicans. Nevertheless, the Apaches failed to provide Kearny with the mules, and he consequently called the creek where the rendezvous was to occur "Disappointment Creek" (now Dripping Springs Creek). 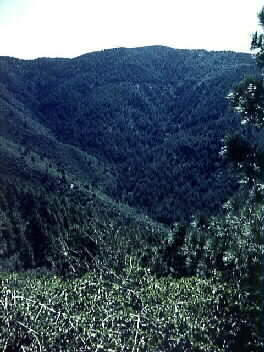 For about a week Kearny struggled to find an acceptable path out of the Pinal Mountains that could possibly serve as a route for the Mormon Battalion. He finally concluded that it was fruitless, but he did recognize the great mineral potential of the area, being the first to name Mineral Creek, where the Ray Copper Mine is now located. Finally, Kearny left the Pinal Mountains and proceeded to the Pima Indian settlements at what is now Sacaton. He then continued on to the mouth of the Gila on the Colorado River, arriving there on 22 November 1846. On December 6, within forty miles of the Pacific Ocean, Kearny had his first battle with "Californios" at San Pascual. Much of the combat was hand-to-hand, and Kearny lost about one-third of his men. On December 12 Kearny finally arrived in San Diego and took command of the California Territory, completing the orders he had received from Washington. Over the next few months Kearny had to assert his authority throughout California, but was finally successful in doing so. In 1847 he was sent to assist in the conquest of Mexico City, but he became ill and was sent back to Missouri to recuperate. He died there in the same year that the final treaty was signed with Mexico (1848). Returning now to the second main force of Kearny's command--the Mormon Battalion--part of the unit, unable to withstand the rigors of the march (some women and children originally accompanied the men, and also several men became ill), was detached and sent to Pueblo, Colorado, 18 October 1846. (Another detachment also left the main group to go to Pueblo on November 10.) The Pueblo detachments eventually joined the Mormon pioneers in Salt Lake City. The rest of the Battalion, however, left Santa Fe, following Kearny's route, on October 19. However, after arriving in southern New Mexico, they decided to deviate from Kearny's route by entering Arizona further to the south. This was because they were aware that they could not take wagons over Kearny's route. As they had several wagons with them, their guides (mainly Antoine Leroux and Pauline Weaver) advised them to enter Arizona at the old San Bernardino ranch (near today's Douglas). They arrived at San Bernardino on December 2. The wagon route they then pioneered through Arizona later became the primary route through Arizona, being followed by Butterfield's stagecoaches and later, the Southern Pacific Railroad. On December 9 the Battalion arrived at the San Pedro River (near what is now Hereford--close by St. David). It was at this site that the Battalion had its only battle--with wild bulls. About twenty bulls were killed, but no man was seriously injured. The Battalion's chaplain and head musician, Levi W. Hancock, one of the First Presidents of Seventy of the L.D.S. Church, composed a song about the event. On 16 December 1846 the Battalion entered the Mexican village (about 500 people) of Tucson. The presidio garrison had already evacuated the fort, retiring to the south. They had no desire to shed blood, and neither did Lieutenant Colonel Cooke. So, although the U.S. flag was raised over Tucson by Private Christopher Layton, Company C (Layton later returned to Arizona and became a prominent citizen), no one in the village resisted. The Battalion quickly continued their march, passing through the Pima villages (at Sacaton), and arrived at the Colorado River on 9 January 1847. The march from Tucson to California was extremely arduous. Great hunger, thirst, and fatigue were experienced. By the time the Battalion reached San Diego on 29 January 1847 the men were elated that one of the longest marches in military history was finally over. The Battalion encamped at San Diego near the old Spanish mission, and on 30 January 1847 Lt. Colonel Cooke congratulated them by writing, "The Lieutenant-Colonel Commanding congratulates the Battalion on their safe arrival on the shore of the Pacific Ocean and the conclusion of their march of over two thousand miles. History may be searched in vain for an equal march of infantry." General Kearny later also congratulated the Battalion by stating (9 May 1847), "Bonaparte crossed the Alps, but these men have crossed a continent." Just as Kearny was successful in occupying Mexican territory that was later to become a part of the United States, so were the other American generals in their operations against Mexico. Generals Zachary Taylor, John E. Wool, and Winfield Taylor all fought battles within Mexico itself, and even Mexico City was taken. Finally, at the Treaty of Guadalupe Hidalgo in 1848 Mexico ceded all its northern lands to the United States. However, it wasn't until 1854, when the Gadsden Purchase was concluded, that the southern part of Arizona (south of the Gila River--which includes Tucson) was also added to this territory. Henry, Robert Selph. The Story of the Mexican War New York: Bobbs-Merrill Co., 1950. Tyler, Daniel. A Concise History of the Mormon Battalion in the Mexican War. Glorieta, NM: Rio Grande Press, 1969.